client satisfaction. This ethos is essential to the continued success of our business. factor in our communications with clients. TKC have experience of undertaking the Lead Consultancy/Project Management role when the content of a given project is completely M&E services and the Main/ Principal Contractor is the Mechanical or Electrical Contractor. We have electronic templates for relevant Contract Administrators/project certification, formal minutes, change order forms, etc. which enable us to perform the additional duties that this role dictates. TKC can provide design services for mechanical, electrical, IT cabling systems and above ground drainage to projects ranging from small scale to multi million pound complex developments. Our design philosophy is to provide a holistic and flexible approach at all times to achieve the highest standards of design whilst still tailoring our design solutions to meet specific project criteria. We provide cost effective solutions that utilise the latest proven technology and equipment to meet the needs of our clients and the requirements of the project. 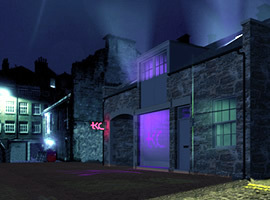 TKC employ qualified engineers who can provide high quality design & specification on a variety of project types. TKC operate an open plan design office philosophy whereby we work together with both core disciplines (electrical & mechanical) to produce properly coordinated design solutions. Our aim is to constantly develop our design solutions and tailor each to provide our clients with an energy efficient and sustainable solution wherever possible. TKC also have knowledge and experience in the various types of water based fire protection systems such as residential sprinkler and sprinkler mist systems and can advise on the most appropriate solution for individual projects. We utilise the Specification Expert platform for compiling all our technical specifications. In certain instances a client may dictate a ‘Contractor Design' procurement route to be applicable as opposed to the traditional/full design route. Where such circumstances occur, we can provide a ‘performance' specification as a benchmark document against which contractors will base their own design and tender submission. TKC have a wealth of knowledge and experience dealing with the known utility providers and have built up working relationships with a number of senior decision makers therein over a number of years. We understand the procedures required to obtain an efficient quotation for new supply where required or alterations to existing supplies where brownfield development projects are being undertaken. Effective and planned preventative maintenance is an essential item for buildings and their systems. Large amounts of money can be spent and indeed wasted if maintenance is either ignored or treated as reactive only. TKC have a number of existing clients with multi site operations where we have created planned preventative maintenance documentation/contracts and have tendered and subsequently managed the implementation on site for our clients. In recent years the topics of ‘sustainability' and ‘renewable energy sources' have become widely used in the early stages of project consideration/briefing. In many cases the desire to be seen to be environmentally friendly has fallen flat due to a lack of proper understanding and appraisal of the options available, their viability and the actual capital costs involved relative to gain/benefit. TKC have undertaken a number of options appraisal exercises for a number of varied projects but unlike many other M&E consultancies, we have also implemented a number of projects in Scotland where renewable solutions have been adopted. TKC are CIBSE accredited Energy Advisors who can provide Energy Performance Certificates (EPC's) for all commercial buildings and for new build residential properties. EPC's are now required by legislation on all new commercial buildings and are further required for all domestic and non domestic buildings that are offered for either sale or rental.